Do you need a food revolution? Jamie Oliver thinks we do. And with 7 out of 10 Americans overweight or obese, I am inclined to agree with him. In "Jamie's Food Revolution" (Hyperion, 2009), Jamie tries to teach us how to cook. With absolutely gorgeous photos (yes, I am jealous) and fun prose, he includes a bunch of really easy and tasty dishes including Classic Tomato Spaghetti, Best Ever French Beans, and Chicken Tikka Masala. The book is heavy on meat and not low on calories. BUT, his goal is to teach and motivate people who don't know how to cook to give their kitchens a try. He wants you to try a recipe, and then have a dinner party where you teach the recipe to a friend. Then he wants your friend to teach someone else. This way, home cooking will go viral!! I agree that almost ANYTHING that you cook at home will be better for you than take-out or restaurant food. If you don't know how to cook, or need more motivation to cook, this book is for you. I chose his "Mexican-Style Corn" recipe because I thought it was a great way to convince vegetable-phobes to try fresh corn. It is arriving in my grocery store now, and I couldn't wait to have some. Hurray for summer!! So, an ear of corn is about 63 calories and when you add butter and cheese it goes up to 200 calories. For the dieting among us, this is a treat and plain corn (if it is fresh) is delicious on its own. My daughter loved this version (and so did I). 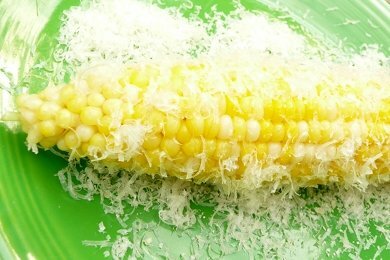 The Parmesan is salty and it complements the corn amazingly. You get a salty, sweet, and creamy rush and just want to eat more! It is simple and delicious. From JAMIE’S FOOD REVOLUTION by Jamie Oliver. Copyright © 2009. Published by Hyperion. Available wherever books are sold. All Rights Reserved. Boil 4 heads of corn on the cob in salted, boiling water for 8 to 10 minutes with a lid on the pan. When tender, drain in a colander. Grate 3/4 cup of Parmesan Cheese over the surface of a large serving platter or over 4 individual serving plates. Halve, seed, and finely chop 1 Fresh red chile and sprinkle evenly over the cheese. Place a little pat of Butter on each cob and brush over the corn to coat. When the butter has melted, roll each cob in the cheese and chile, so the flavors stick to the ouside. Season with a good pinch of Salt and pepper. Serve with lime wedges for squeezing over. How do you cook and season your corn? My husband grills our corn outside and bastes it with olive oil mixed with salt and pepper, minced garlic and lime juice. AMAZING! I love what Jamie's doing - for the majority of people (especially men, let's face it!) it doesn't even have to be about eating for weight loss. Switching away from processed junk to stuff where you can buy every ingredient at a farm shop (even if they have to bring it in from another farm) can really only be a good thing! It's such a shame he has been met with such defiance and aggression. Just what everyone needs for this weekend...YUMMY cheese corn on the cob. The vast majority of corn sold today is genetically modified. That means the pesticides are genetically engineered into the corn's DNA. You can not wash it off. Soy, too. Look for non-GMO corn and soy produce and products. Your future health depends on it! Jaime says to cook for 8 to 10 minutes? We bring a pot of water to boiling, and slowly add the corn while keeping it boiling. 2 minutes later it's done. Being a new reader here, I am not sure if you've already mentioned this, but I find that Mark Bittman's cookbooks also discuss food/food history/food information in a conversational form, and his recipes really inspire you to stay home and try things for yourself. His "How to Cook Everything Vegetarian" revolutionized the way my husband and I approach food, cooking, the kitchen...Bittman gives you courage! BTW I am really enjoying your blog! I microwave my corn in the husk for 3 minutes.....makes it must sweeter!